Cicindela formosa gibsoni… or not! 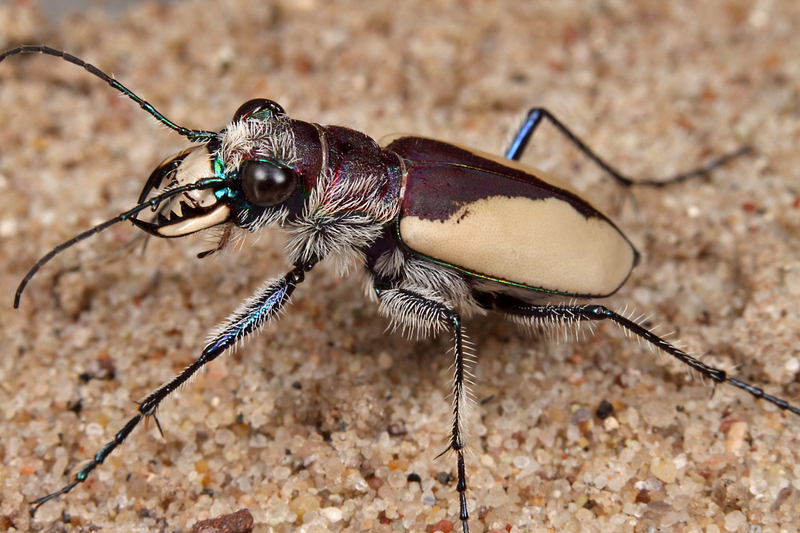 Last Friday I began the 2011 Annual Fall Tiger Beetle Trip™. This year’s edition was actually a last-minute change—my original plans to collect wood for rearing wood-boring beetles in south Texas thwarted by that state’s long and continuing drought (along with the unwillingness of some of the area’s federal wildlife refuge managers to grant my research study permits despite the work I’ve done there in past years—apparently only institutional and not personal research is now deemed credible by these courageous individuals who are doing their best to protect the natural resources in their charge). My travel funds are limited, and rather than throw good money at a bad situation, I decided to pursue greater chances of success and make the trip that I have wanted to do for some time now—the Great Sand Dunes tour through the Rocky Mountains and Great Basin. The target species include many of the classic western sand dune species, and I hope to feature most of them in the days and weeks after the conclusion of the trip this coming weekend. The first of these target species that I encountered is the subject of this post, Cicindela formosa gibsoni (Gibson’s Big Sand Tiger Beetle). This large, robust, and gorgeously marked subspecies is highly restricted in occurrence, curiously to two areas separated by more than 1,000 km—the Maybell Sand Dunes in northwestern Colorado (Moffat County) and the Great Sand Dunes of southwestern Saskatchewan. It is distinguished from the nominate form and other subspecies by having the white markings of the elytra so expanded in most individuals that they coalesce and cover nearly the entire elytral surface. 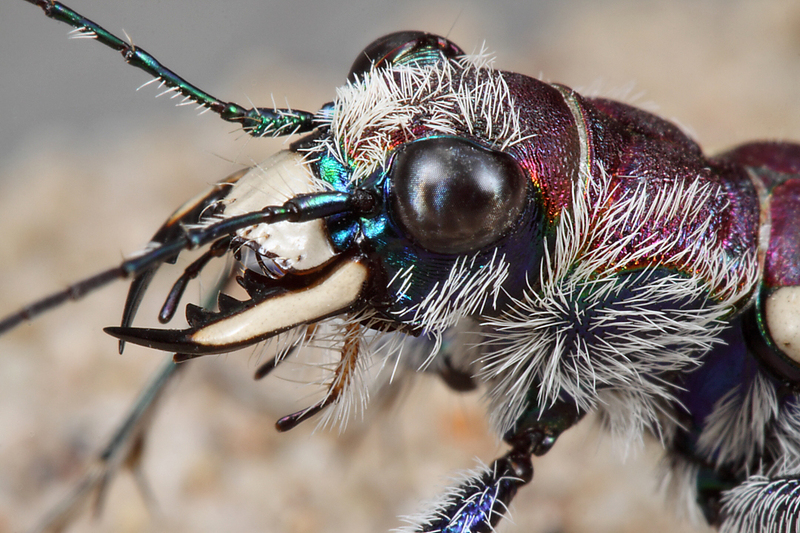 The result of such a large white surface with contrasting red-purple head, thorax, and elytral sutural area is one of North America’s most spectacularly marked tiger beetle species. The individual photographed here was one of many observed a few days ago on the Maybell Sand Dunes¹, and I feel truly lucky to have been able to personally witness these striking beetles flying powerfully across the dunes in their small home range, landing far away with the comical bounce and tumble that is characteristic of this and the other subspecies. ¹ In the interest of full disclosure, these photos were taken later in the day using subjects confined in a terrarium of native substrate. I had intended to photograph them in the field; however, they unexpectedly began digging burrows around 2 p.m., and my efforts to stalk the last few stragglers before they disappeared were not successful. An interesting situation occurs regarding the taxonomy of this subspecies. Despite the nearly identical appearance of adults from both the Saskatchewan and Colorado populations, logic and differences in larval coloration suggest that these two populations have arisen independently, their common appearance a result of convergence rather than shared ancestry. Molecular studies are in progress to determine more conclusively whether this is true (hopefully augmented with material collected during this trip). The subspecies was originally described based on specimens collected in Saskatchewan, thus, if convergence is confirmed the Maybell population will find itself needing a new name. Congratulations to Doug Taron, who narrowly beat perennial heavyweight Ben Coulter, Tracy Mormon and Mr. Phidippus for the ID Challenge #12 win. The overall standings remain unchanged, with Ben still in the lead with 65 points, Mr. Phidippus 2nd with 54 points, and Roy completing the podium at 39 points. The final standings may seem like a lock, but there will still be one more challenge in the session—anything can happen! This entry was posted in Cicindelidae, Coleoptera and tagged beetles, Colorado, entomology, insects, science, taxonomy, tiger beetles. Bookmark the permalink. 11 Responses to Cicindela formosa gibsoni… or not! Fantastic photos, Ted. I think I hate you just a little bit too. What was the temperature when they started burrowing, if you don’t mind me asking? Not exactly sure about the temps – it had just surpassed 70 when we arrived at the site at 11am and was probably in the low 80s at 2pm when they began digging in and we left to check out another site. We came back about 3:30pm and they were all gone – was only able to dig out a single adult (too many old burrows mixed in with new burrows). I’m sorry your original trip plans fell though. I, for one, would be really interested if you did a post (or two) discussing your wood collecting and rearing techniques. Considering the success I’ve had this week (many stories still to come) I’m not sorry at all! If I do go on another wood collecting trip I’ll definitely be taking photographs during the process to support a few posts. Need I say that I am absolutely green with envy! Hope the weather has been good for your trip. Interesting bias in some of the TX feds. Is part of the definition of a scientist now ‘affiliated with an institution that receives large federal grants’? Sounds illegal to me. You should complain to your Congressional representative. The Sangre de Cristos at the end of the trip were just one of many spectacular places we saw. I really can’t wait to do more entomological exploration throughout the area. I could forgive the skepticism of a fed area manager if I had no research history at the site or string of publications to show for my efforts, but to so summarily dismiss anyone without institutional affiliation despite such is power trippin’ at its worst.